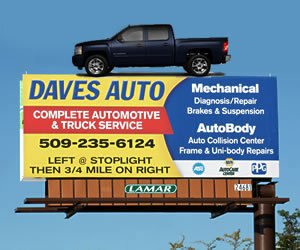 Dave's Auto Repair, Cheney WA; Chosen as the mechanics of choice to install many of the accessories on our 2011 Chevy Silverado 1500, Dave's Automotive in Cheney WA has earned a reputation of quality and fair play in the Spokane Washington area. No job is easy in the hands of unskilled personnel, Dave's Auto Repair has proven themselves over and over with us when working on our trucks, boats and motorhomes. From building a potent 383 stroker and installing 4.56 gears in our 1998 Chevy Silverado to repairing the axle seals on a notoriously leaky rear axle on our motorhome. Not one, but two front axles on the 1998 Chevy Silverado after booning in the sand dunes of Moses Lake and being there to tow the vehicle when driving became impossible. Big tires, sand dunes, and a heavy throttle can be a nasty combination. So now we have returned so Agnar and his crew at Dave's Automotive can replace the stock exhaust with the Borla Cat Back System, add the cold air intake, install the ReadyLift front end leveling kit, regear the truck with 3.73's and install a set of LT285/70/17E Cooper Discoverer A/T3 tires to finish off the looks we were after and add a bit of performance at the same time. Accessorizing any new truck is far more enjoyable then the standard repairs and maintenance tasks we normally ask of our mechanics and we hope they enjoy the process of making an already excellent truck into a personal work of art.